Black technical jersey with green and red Web stripe. Gucci flame-dyed and bleach-washed Bermuda shorts. Approx. measurements: 12" rise; 22" inseam. Five-pocket style. Straight, relaxed legs. Button/zip fly; belt loops. Cotton. Made in Italy. 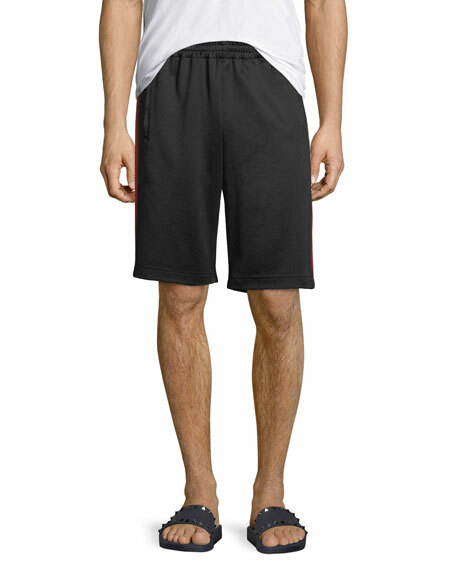 Gucci jogger shorts in felted cotton jersey. Logo jacquard trim along side seams. Elasticized waistband. Flat front; mid rise. Side seam pockets. Made in Italy. Gucci swim trunks in allover bee embroidery. Elasticized drawstring waist. Straight legs. Pull-on style. Nylon. Imported. 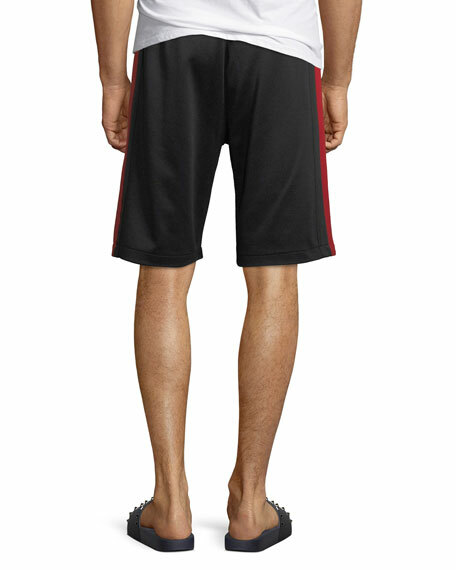 Gucci track shorts with scarf-print front and velvet back. Elasticized, drawstring waistband. Relaxed, straight legs. Side stripe detail. Hits at knee. Pull-on style. Cotton/nylon. Made in Italy.